Other than baby cuddles, one of the best things about a friend having a baby is the opportunity to make a new baby quilt. A friend recently had a baby boy and I made this baby quilt for her new arrival. Now that it’s been gifted, I’m going to share the tutorial. It’s a simple design, but in my opinion, a baby quilt doesn't really need to be overly complicated. From each of the (10) Fat Eights, cut (2) 9” squares which will yield 20 squares. If using a Layer Cake, trim the squares down to 9” x 9”. Solid white fabric : Depending on the width of your solid white fabric, cut (4 or 5) 4”strips x WOF. Cross cut 4” squares from these strips. You will need (40) 4” squares in total. * So as not to waste fabric, I’d suggest cutting the first 4” x WOF strip and then cross cutting the 4” squares. See how many you get from this first strip and then calculate how many strips you will need. Use a lead pencil to draw a line diagonally across each white square. Now let’s assemble the blocks. Take the first white solid square and place it on the bottom right corner of the 9” print fabric square. If the print is directional, be sure to take this into account. We will be sewing the white squares on the top left and bottom right of the print fabric. Line up the edges and sew right on top of the drawn line. Continue this step and complete all 20 blocks. Place the remaining white squares on the top left corner of the print squares and once again, sew right on top of the line. Use your ruler and rotary cutter and cut 1/4” outside of the drawn lines. This will will give you lovely a 1/4” seam. Press the the seams to the dark (print) side of the fabric. On a large flat surface, lay out the 20 blocks into a 4 across, 5 down configuration. Try to have the prints and colours all spread out evenly. Once happy with the layout, sew the blocks into rows. Sew the top row with seams to the left. The second row with seams to the right. Third row left. Fourth row right. Fifth row left. Pin and sew the rows together in order, ensuring that the seams are nesting nicely. Press the quilt top well and use a little spray starch if necessary to achieve a lovely crisp finish. Quilt as desired. I decided on a loopy meandering quilt design. This really does seem to be my go-to quilting design. Add your binding as normal. Don’t forget to add a quilt label if this is going to be a baby gift. A Fat Eighth bundle will yield 4 baby quilts of this size and a layer cake will yield 2 baby quilts. 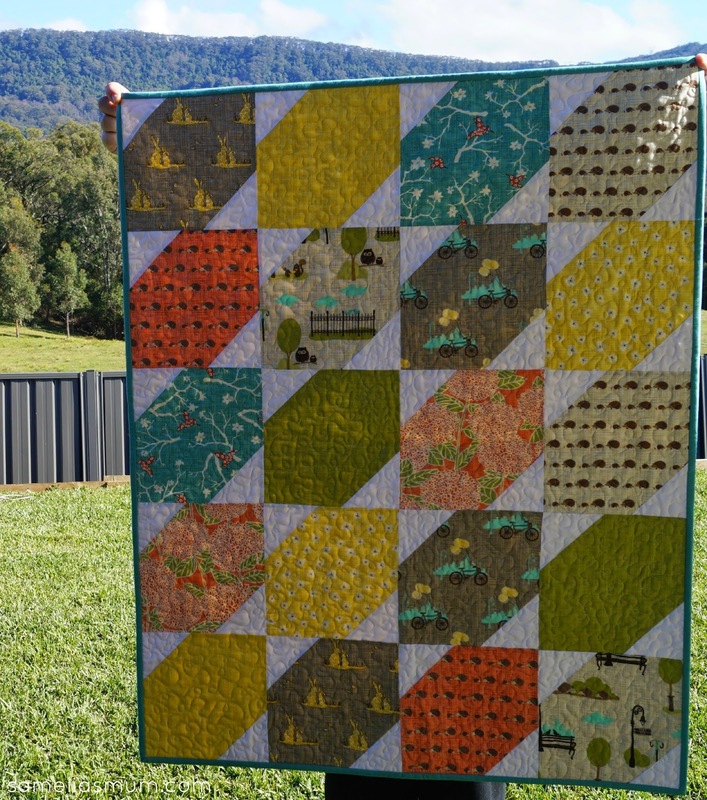 I hope you enjoyed making my BlueBird Park Baby Quilt and please share your photos if you decide to make one using my tutorial. I’d love to see how you go. I like this block -- no seams to match except at the block's corners. Thanks for the quickie. Thanks for the tute! I've been hoarding a fat eighth bundle, and I think I'll have to give this a try! Love it... give me a week-end project any day!